Genesis 1:27-28, "God created mankind in His own image: in the image of God He created him; male and female He created them, and He blessed them". God's purpose in the creation of man is to (Gk. 'phaneroo') make His true character so thoroughly understood by teaching that He becomes visibly manifest in the material form of His Body, the Church, who are His Attributes reflecting the glory of His Being in whom as His glorified Family He will be worshipped throughout eternity. This is the true Temple or dwelling place of the Lord God foreordained from the foundation of the world, and He showed Moses the pattern in conformity to which it must be made. Moses and Solomon built its representation with human hands, but as Paul explained, "God who made the world and all it contains, being Lord of heaven and earth, does not dwell in temples built by human hands" (Acts 17:24). "We are to come to Christ, that living Stone, rejected by men but chosen by God and precious, and be built up as living stones into a Spiritual house, a dedicated priesthood, to offer Spiritual sacrifices that are acceptable to God through Jesus Christ" (I Peter 2:4-5; I Corinthians 7:19). Thus "we are His workmanship, created in Christ Jesus for good works, which God has foreordained that we should live in" becoming "written epistles" of the Word for our day (Ephesians 2:10; II Corinthians 3:2-3). This is the creation of God, who's Head and beginning is Jesus Messiah, born of a virgin just 2,000 years ago. His mystic Body, the Church, is the continuation of the same creation through her second birth by the spoken Word of Promise (Revelation 3:14). Although we are individual members of Christ's Body with different abilities, personal obligations and responsibilities to the Brethren, we were all baptized into the Body by a measure of the faith commonly ordained to meet challenges peculiar to our day. So the corporeal Body is built up of nine dispensations of grace each defined by the measure of faith ordained to the gift of Christ for each Age. Christ's gift to the Church is the five-fold ministry of men who are apostles, prophets, evangelists, pastors, or teachers. Their vocation is to equip those who are saints for the task of ministering toward the building up of the Body of Christ by admonishing, helping and encouraging the Brethren, supporting their pastor and living so that their Token of the Life of Christ is on public display, "trusting Christ in their hearts as Lord, and ready always to answer anybody who asks for a reason of the hope that is within them, yet with gentleness and reverence" (I Peter 3:15). Christ's Bride is in the stature of a perfect Man, God's second Masterpiece built of lively stones. Christ's gift of the five-fold ministry will be in the Body "until we all attain to the unity of the faith, and that understanding of that Son of God, to a mature man, to the measure of the stature of the fullness of Christ: that we should no longer be babes, swung back and forth, and carried here and there with every wind of doctrine that springs from human craftiness and ingenuity for devising error. Rather, speaking the truth in love, we should grow up in every way toward He who is the Head, into Christ" (Ephesians 4:13-15). The accompanying diagram illustrates how the pattern of God's second Bible, which Enoch wrought in stone before the Flood, has been transformed into the "substance of things [God had] hoped for"a true living Temple. The double line at its base signifies the "foundation of the apostles and prophets, Christ Himself being the chief cornerstone" (Ephesians 2:20; I Corinthians 3:11-13). This we call Alpha or the Word at the beginning, which was the brief holy convocation of Pentecost (AD33-53) wherein the saints received and understood the pure Word of God (Jude 1:3). The Bible was sealed with Seven Seals unto the time of the end (Daniel 12:4, 9; Revelation 10:4), so from Pentecost until the close of the Church Ages the saints had only PART-Word with Christ as a mediator for their ignorance of the fullness. So long as one understood and was living the Word for his day Christ received His faith, placed his ignorance under the Blood and baptized him into his position in the Body. As Jesus explained in Revelation 1 to 3, He sent an "angel" or major apostle to each of the seven Church Ages inspired by a different measure of the Spirit to rebuke and correct those who had fallen away from the Message of the preceding Age, then reveal the Word for the new Age. The evidence of the baptism with the Holy Spirit or new birth is a clear revelation of the Word for the hour; this causes our life to display a particular virtue of the Life of Christ as indicated on the diagram (II Peter 1:1-8). The seven Church Ages represent Revelation 2 and 3. The world church system apostatized in 1963 "and knows it not." This is illustrated by the breach between the close of Laodicea and the Capstone and represented by Revelation 4 and 5 which show when the Blood was removed from the Mercy Seat it became a Judgment Seat. Now Jesus advanced from the Outer Court where the bloody body of the Lamb had lain on the altar of sacrifice as a memorial, claimed the Book of Redemption, tore open its Seals, and sat down on the Judgment Seat. He is no longer in the office of Son of God and Mediator but as Son of Man He is Judge (John 5:27). In Revelation 10:1-6 (I Thessalonians 4:14-16) the Lord Himself descended, placing judgment on the beast of Papal Rome, on the United States of America the image of Imperial Rome and her (once) Protestant daughter churches, which are the image of Papal Rome (Matthew 25:6; Revelation 18:4). At this point Brother Branham received His "Elijah" anointing to reveal the mysteries of the seven thunders of Revelation 10:3-7 which are the revelations contained in the Seven Seals. It is these divinely revealed "mystery-truths" that are literally turning the hearts of the children back to the apostolic faith (Malachi 4:5-6). The revelation of the Seven Seals brought Christ back to earth in WORD form (I Corinthians 13:10; Revelation 10:1-7). "The restoration of all things spoken by the mouth of all God's holy prophets since the world began" is the fullness of the Word which is Christ, the Logos. And Brother Branham's Message is the "Shout" of I Thessalonians 4:16 calling the wise and foolish virgin out of the world church system into Christ for the manifestation of the Sons of God and the translation. 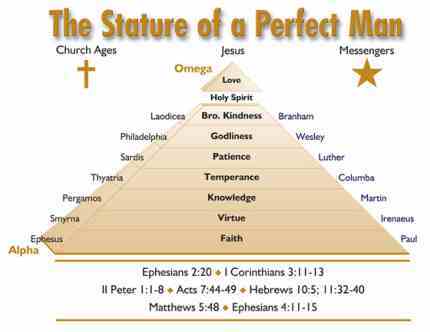 Born of the fullness of the Word, Christ's end-time Bride is forming the Capstone of the Pyramid. As Jesus Christ, "the Head of the corner" was rejected by the builders, Christ's end-time Bride will be "set at nought" by the world church system as they "crucify unto themselves the Son of God afresh, and put Him to an open shame" (Hebrews 6:6). The corn of wheat fell to the ground and died on Calvary, but within three days it rose again and brought forth the Alpha Bride of Pentecost. The apostolic saints sowed and their Message brought forth, "a hundredfold, sixty, and thirty fold" in the first three Church Ages as the faith was hybrid with Jewish fables, Gentile myths and organizational creeds until it, too, fell into the ground and died. It did not revive until God inspired Martin Luther, the angel to the Sardis Church Age, with the mighty revelation, "the just live by faith" (Romans 1:17; Galatians 3:11; Hebrews 10:38). Brother Martin Luther started the reformation of the Roman Catholic system of worship in which the corn of wheat put forth leaves, then the tassel in Philadelphia, and the shuck in Laodicea. In the third day God sent forth the Prophet William Branham whose ministry sowed for the "latter rain" and brought forth original grain that will manifest the Sons of God and be translated. He is Alpha and Omega, the Word at the beginning and the same Word restored at the end; He was not the PART-Word that made up the Church Ages in between. All seven Church Ages are over, and since we now have the perfect interpretation of the Word we are in the holy convocation of the fiftieth day of the Pentecostal Feast and unlike the Church Age saints we do no servile work presuming to interpret God's Word. In Ephesians 1:3-14 Paul expounds Genesis 1:27-28 and God's purpose, "How we praise God, the Father of our Lord Jesus Christ, who has blessed us with every blessing in the Logos because we belong to Christ, even as He chose us in Him before the foundation of the world, that we should be holy and blameless in His Presence. In love He has predestinated us to be recognized as His children through Jesus Christ according to the kind intent of His own will, to the praise of the glory of His grace, which He has bestowed on us in the beloved. In Him we have redemption through His blood and the forgiveness of trespasses, to the measure of the riches of His grace; which He lavished on us, making known to us in all wisdom and insight the secret of His purpose, according to His kind intention which he proposed in Christ: a plan to be brought to completion in the fullness of times (Gk. 'kairos,' opportunity or "once in a lifetime" times. See Newsletter #286) to unite everything together in Christ, things in heaven, and things on earth." The expression, "In the image of God He created him," with no mention of the word "likeness," shows us that in God's great thinking mankind received the dignity of His image as an Attribute of the Logos, which is His eternal unchanging thought expressed. That is we, our soul, is a spirit as God is a Spirit, but the perfection of His "likeness" in us has been reserved for the consummation, because that is the Christ-like character to which we attain only by overcoming adversity and acquire for ourselves as individuals by the exercise of our free moral agency in diligent imitation of God. The possibility of attaining to perfection was granted to Adam's race "in the beginning" through the dignity of the divine image with the perfect realization of the divine "likeness" being reached in the end by becoming a written epistle of the present Truth or recognizing our day and manifesting its Message in our life. Thus works are faith expressed (James 2:18). "It is at the resurrection that the Royal Seed will see many royal seeds like unto Himself, and they will be even as He is, for says John, "we shall be like Him." This is what John the Baptist was referring to when He said that Jesus would gather the wheat into the garner. That was the resurrection where the redeemed who had been elected unto eternal life came in" (William Branham, An Exposition of the Seven Church Ages, p. 283; I John 3:2). Our Lord will appear when that last elected member to the body of Christ comes in, and manifest Himself in his resurrected and translated Body (John 6:37-39). Philippians 3:21, "He will transform and fashion anew the body of our humiliation to conform and be like the body of His glory and majesty, by exerting that power which enables Him even to subject everything to Himself." Then we shall be "like Him" and manifest that we are the Sons of God (Ephesians 1:19-23; Romans 8:19). I John 2:28-3:3, "Now, little children, remain permanently in Him so that when He is (Gk. 'Phaneroo') manifested to reveal His true character, we may have confidence and bold assurance, and not be ashamed and shrink from Him at His (Gk. 'parousia') Coming. If you are sure that Christ is absolutely righteous, [conforming to the Father's will in purpose, thought and action], you will be just as confident that everyone who does righteousness [and therefore in like manner conforms to the divine will] is born of Him". "See, what an incredible quantity of love the Father has bestowed on us, that we should be named and called and accounted the Sons of God! And so we are! The reason the world does not recognize us, is that it does not acknowledge Him. Beloved, we are right now the Sons of God, and it is not (Gk. 'Phaneroo') made clear what we shall be: but we know that, when He (Gk. 'Phaneroo') is manifested [in us] we shall be in His likeness; for we shall see Him as He really is. And every one who has this hope in Him purifies himself, even as He is undefiled and guiltless." John points out with the utmost certainty that not only was the end of all things to be hoped for but also the likeness to God. "We shall walk with Him in white, for we are worthy." We have identified ourselves with Him on earth and He will identify Himself with us in the New Jerusalem. God is going to reward those who follow His advice in Revelation 3:4-5. When Peter, James and John saw Him on Mount Transfiguration His clothes were as white as light. That is how the saints are going to be clothed. Their garments will be shining, exceedingly white. "Fine linen is the righteousnesses of saints". Now we shall consider the Pentecostal Feast from Leviticus 23. On the third day after the Passover, the sheaf of the firstfruits of the barley harvest was waved by the priest. By this act Israel consecrated the whole of the harvest unto the Lord, and was only permitted to use it when they received it back as a Gift from Him. This wave sheaf represented Christ who was lifted up on the Cross as Moses lifted up the serpent before the people in the wilderness showing sin was judged (Numbers 21:8-9). Jesus was waved before the Father and accepted in that God raised Him from the dead for the justification of everyone who comes to the Father by faith in the Son. Like the first-born Son, the firstfruits of the harvest were considered the choicest. Their acceptance consecrated the whole of the harvest. Jesus was the firstfruits of the Old Testament saints who rose after His resurrection, and the New Testament saints who are Christ's at His parousia  that's NOW (I Corinthians 15:23). We become one with the Bread of Life or finished product of the wheat as the gift of the Holy Spirit in a new birth. Soon there will be another resurrection: the sleeping New Testament saints will be raised while we who are alive and remain will be waved as a two loaves baked with leaven in the manifestation of the Sons of God, and then we shall be changed in the atoms to meet Christ in the air. The Sheaf Wave Offering introduced the Feast of Firstfruits, or Weeks: better known as Pentecost. Whereas the Feast of Unleavened Bread marked the absolute beginning of the grain harvest, with barley, the Pentecostal Feast marked its completion with the reaping of wheat. It was divided into nine divisions, beginning with the last six days of the Feast of Unleavened Bread that represented the primitive Church who held and understood the pure Word of God undefiled. Seven rests or sabbaths followed, representing the seven different baptisms of the Holy Ghost, or new births that differentiate the seven Church Ages. As Moses and Joshua led Israel to a place where they could find natural rest for their body and spirit Jesus said, "Come unto Me, all who labour and are heavy laden, and you will find Spiritual sabbath for your soul" (Matthew 11:27-29). The sabbath for Christians is a rest for the soul, or new birth. When we enter our Spiritual Promise, we've ceased from our own works. And just as Israel's sabbath could only be observed in the Promised Land, outside which their Old Covenant is of no effect, so our sabbath can only be observed in God's provided Place of worship, Christ, the living Word for our day, not the Word for the days of Luther, Wesley, or the Pentecostals. These seven rests or Church Ages were followed by another rest on the fiftieth day, the antitype of which is this present holy convocation wherein: "the mystery of God is finished," the apostolic faith is restored, and God's elect are called out from all man-made systems into oneness with the fullness of the Word. It's called an holy convocation because unlike the Church Age saints, who presumed to interpret God's Word, we do no servile work as we have "the true sayings of God" who sent us a prophet with THUS SAITH THE LORD that finished the mystery of God by the revelation of the Seven Seals to bring Christ's end-time Bride to maturity by agreement with the fullness of the Word, for the manifestation of the Sons of God and the translation. As we study the types in Leviticus 23:15-22, we discover that in the fiftieth day after the presentation of the Wave Sheaf offering (which was fulfilled in the resurrection of Jesus Christ), "a new grain offering of two loaves baked with leaven" was to be waved before the Lord. The wave loaves being a finished product, signified fruits previously gathered from the day of Pentecost to the completion of the harvest, waved before God as a thank offering. Christ is Alpha and Omega, the pure Word at the beginning reproduced in the Pentecostal saints, and the pure Word reproduced in His end-time Bride. The Alpha Church was mainly Hebrew with a small number of Gentile converts who had been proselytes to Yahweh Torah. At the Hegelian dialectic engineered in the first Nicaea Council in AD325, the carnal mass organized the Universal Roman church in union with the world power, and the corn of wheat fell into the ground and died in the Thyatira Church Age. It began to revive with the Reformation as a predominantly Gentile Church in the Sardis Church Age, and since both loaves must be identical, after "the dispensation of the fullness of [the seven] times," the SAME faith Paul preached to the Bride in the beginning of the dispensation has been restored to Christ's end-time Bride in this holy convocation. Thus His many membered Bride is symbolized by the two identical loaves comprised of Israelites and Gentiles born of the original Seed (Luke 8:11). "For Christ is our peace, who has made both one, and has broken down the middle wall of partition between us . . . to make in Himself one new man, so making peace; and through the cross reconcile both in one Body to God . . . carefully joined together in Christ and growing into a temple that is holy in the Lord, in whom you are also built up together for a dwelling place of God in the Spirit" (Ephesians 2:14-22). The end-time Bride under pre-eminence to the Fullness of the Word by her revelation of the Seven Seals will be waved before the Lord at the manifestation of the Sons of God, in behalf of our brethren who have fallen asleep since Pentecost. We are all one body, and without us, the sleeping saints cannot be made perfect, or glorified. We will be waved before the Lord as the finished productgrain prepared for food, but baked with leaven, which represents our sinful flesh, for all are not yet glorified. When we change in the atoms, this corruptible flesh will put on incorruption, mortality will put on immortality, and we will lose the leaven.